The Best RPG blogs from thousands of top RPG blogs in our index using search and social metrics. Data will be refreshed once a week. Also check out RPG Youtube Channels. RPG newsletter is a comprehensive summary of the day's most important blog posts and news articles from the best RPG websites on the web, and delivered to your email inbox each morning. To subscribe, simply provide us with your email address. UK, USA & Japan About Blog RPG Site is the premiere source for RPG news, reviews, previews, interviews, media and information. We love role playing video games, so we report on them all day every day. Facebook fans 7,648. Twitter followers 67,901. Southampton About Blog Morrus is the founder and owner of EN World, and owner of EN Publishing. It is the world's largest independent RPG news website. Find EN World's news and reviews of all tabletop roleplaying games, big and small. Facebook fans 14,253. Twitter followers 12,352. About Blog Founded in 1997 as LunarNET, RPGFan has grown into one of the premiere news and media sites dedicated specifically to roleplaying games. The website features reviews, previews, editorials and daily news of the latest in RPGs, graphic adventures and visual novels on all platforms coming in from Japan, Korea, North America, and Europe. Facebook fans 8,417. Twitter followers 5,865. Berkeley, CA About Blog RPGnet is the top independent site for tabletop roleplaying. It includes very busy forums, reviews, columns, and in index of RPG products. Facebook fans 1,489. Twitter followers 2,445. About Blog RPGGeek is a robust community message board centered around a comprehensive database of RPG systems, products, periodicals, and other media. It strives to be the premiere database and forum for all tabletop RPG enthusiasts. This includes News, Reviews, Sessions and Play-by-Forum along with the world's friendliest community. Facebook fans 542. Twitter followers 5,456. Madison, WI About Blog RPGamer is the world's best RPG coverage. Get the Complete RPG Coverage. Facebook fans 1,986. Twitter followers 3,457. About Blog For discussion of traditional pen-and-paper roleplaying games and anything related to their game mechanics and settings, as well as industry events and gossip. This is a forum for discussing roleplaying games. Beaumont, AB About Blog Roleplaying Tips was founded by Johnn Four. It is a website for tabletop GMs. Find posts and updates on roleplaying. Facebook fans 2,625. Twitter followers 3,084. San Francisco, CA About Blog Reddit is a community of millions of users engaging in the creation of content and the sharing of conversation across tens of thousands of topics. A subreddit for meaningful discussions of tabletop/pen & paper RPGs and LARPing. Facebook fans 1,165,202. Twitter followers 523,687. Los Angeles, CA About Blog Hyper RPG is a hyperactive, interactive community-driven broadcasting channel featuring kickass RPGs, innovative tabletop & video games. Hyper RPG pushes the boundaries of collaborative storytelling and shared gaming experiences across the web and around the world. Facebook fans 7,373. Twitter followers 16,889. San Francisco, CA About Blog Reddit is a community of millions of users engaging in the creation of content and the sharing of conversation across tens of thousands of topics. A sub - reddit for Japanese Role Playing Games from past and present. San Francisco, CA About Blog RPG_Gamers is a subreddit for fans of all videogame RPGs from JRPGs (Final Fantasy, Dragon Quest), Western RPGs (Fallout, Baldur's Gate), action games with RPG elements (Diablo, League of Legends), and discussions related to them. Subreddit in general revolves around discussion of RPG videogames, recommendations for new games to try, news of upcoming RPGs, and reviews of recently released RPGs. Facebook fans 1,165,201. Twitter followers 523,687. About Blog A podcast about role playing games and how to run a campaign in when you can't devote 8 hours a week to gaming. About Blog DriveThruRPG.com is part of a family of premiere online marketplaces including RPGNow, DriveThruRPG, DriveThruCards, DMsGuild, DriveThruComics, DriveThruFiction, and Wargame Vault. This is your one-stop online shop for new and vintage RPG products from the top publishers, delivered fresh to your desktop in electronic format. Facebook fans 19,505. Twitter followers 16,369. About Blog RPG Maker gives you the power to create amazing RPG games on your Windows PC. Find the latest in a long line of RPG Maker engines by Enterbrain, allows you to create your own games with little to no experience necessary. Facebook fans 81,496. Twitter followers 15,947. San Francisco, CA About Blog Reddit is a community of millions of users engaging in the creation of content and the sharing of conversation across tens of thousands of topics. A sub-reddit for Western role-playing video games. Facebook fans 1,165,198. Twitter followers 523,687. San Francisco, CA About Blog Reddit is a community of millions of users engaging in the creation of content and the sharing of conversation across tens of thousands of topics. A sub-reddit for anyone, either casually or professionally, designing, hacking, or otherwise working with the mechanics of pen-and-paper tabletop RPGs. Facebook fans 1,165,200. Twitter followers 523,687. North America About Blog Tribality is a collection of advice, homebrews, tools, research, news and other fun tabletop RPG stuff for everyone. Facebook fans n/a. Twitter followers 3,318. About Blog Find RPG News and updates. Chicago, IL About Blog The Angry GM delivers advice to players and dungeon masters of fantasy role-playing games with humor, snark, and attitude. Game masters and players are sure to find something of use, whether they are playing AD&D, D&D 3.5, D&D 4E, 5E, Pathfinder, D&D Next, or any other role-playing game. Facebook fans 760. Twitter followers 9,712. About Blog The little company with big shoes keeps growing! With two gold ENnie Awards in 2012, people are noticing the excellent work done by the Kobold crew in adventure design, how-to advice, and worldbuilding for the Midgard campaign setting. Facebook fans 18,005. Twitter followers 26,943. About Blog I’m Dyson. I’ve been gaming since 1979 in a variety of game systems, but most often playing Dungeons & Dragons. This is a general RPG blog, where I talked a lot about the games I’ve played and how I like to play them. Facebook fans n/a. Twitter followers 3,249. New York, NY About Blog The Elven Tower is a source of original imaginative content and narrative chronicles for D&D and other RPG games. Facebook fans 1,196. Twitter followers 5,118. Facebook fans 1,737. Twitter followers 4,856. Greece About Blog The Kind GM is my blog where I write about tabletop RPGs and especially D&D. I provide reviews, tips and advice for DMs and players and more. My name is Chris. Facebook fans 47. Twitter followers 7,128. Maine, United States About Blog Chester Bolingbroke is a professional in his early 40s who really should be doing something more productive with his time. He lives in Maine with his patient wife, Irene, and when he isn't playing CRPGs, he enjoys traveling, crossword puzzles, and jazz. The CRPG Addict is a blog in which a dedicated addict plays through all PC computer role-playing games (CRPGs), in chronological order. About Blog ALL THINGS ROLEPLAY is the #1 tumblr resource for invisionfree and jcink roleplaying sites! We’re here to advertise and help boost your roleplaying experience! from advertisements, to character requests, all the way to interest checks on site ideas. Facebook fans 71. Twitter followers 1,151. Sydney, Australia About Blog Campaign Mastery is dedicated to offering GMs expert insights and techniques to improve their tabletop RPG campaigns. Mike Bourke is the writer of RPG games & articles, MIDI composer, lover of Sci-Fi & Fantasy and F1 fan. Find posts and updates on RPGs by Mike Bourke. Facebook fans n/a. Twitter followers 4,044. Germany About Blog Stargazer's World is a roleplaying game blog. It's a place where I can write down my thoughts on the roleplaying industry, the community and roleplaying in general. And by roleplaying I mean good old classic pen and paper roleplaying. Chicago, IL, United States About Blog The Other Side Blog is a game design blog from Timothy S. Brannan, author of the Ghosts of Albion RPG and contributor to many horror themed RPGs. Follow his thoughts on game development or even just game playing. Facebook fans 161. Twitter followers 983. About Blog LitRPG is Literature Role-Playing Games. Find the best LitRPG books, including recommendations. We feature LitRPG novels and RPG content. Facebook fans 11,413. Twitter followers n/a. About Blog Hi I'm Matt. I am the Game Master here at dicegeeks. I help game masters, dungeon masters, and role-players level up their sessions and campaigns. I post roleplaying tips, guides, and resources. Level up your RPG campaigns with helpful resources, original rule systems, and campaign settings. Facebook fans 712. Twitter followers 5,125. Urbana, Illinois, USA About Blog Find posts and updates on RPGs. Minnesota, USA About Blog Hi I'm Douglas H. Cole. I have been role-playing since 1981 – starting with Holmes Red Box and AD&D, sampling many systems along the way, and started heavily playing GURPS since 1988. Find posts and updates on GURPs. Kentucky About Blog A blog about Dungeons & Dragons, Roleplaying Games, drawing board for my adventure ideas and a log of those adventures. Facebook fans n/a. Twitter followers 1,304. About Blog Find information on RPGs, SRPGs and otome games. About Blog Hi I'm Peter V. Dell'Orto. I've been playing RPGs since I was about 9 years old. Find posts and updates on RPGs. Reno, NV USA About Blog Stuffer Shack is an RPG blog and accessories store. Find posts and updates on RPG. Facebook fans 94. Twitter followers 190. About Blog A gaming blog about the World of Greyhawk fantasy setting for all editions of Dungeons & Dragons formerly owned by TSR now by Wizards of the Coast. Pasadena, Calif, USA About Blog Happy Jack's RPG Podcast is a roundtable discussion about RPGs. Happy Jacks has been combining beer, tabletop RPGs and humor to create high quality content since 2009. We've assembled a diverse cast of seasoned entertainers, tabletop RPG experts, and nerds to bring you some of the most engaging tabletop content out there. Facebook fans 1,985. Twitter followers 3,305. About Blog RPG Adverts is a directory blog dedicated to promoting all kinds of different forum based roleplays. Facebook fans 119. Twitter followers 666. UK About Blog I've been gaming since 1983 after I experienced the splendour that is Fighting Fantasy gamebooks and Basic D&D. I have played in hundreds of games, mainly as GM, and experienced dozens of gaming systems over pretty much every genre, with the odd boardgame and wargame thrown in, too. I do like to game. Facebook fans n/a. Twitter followers 1,191. About Blog Keep up with Game Discussion, Reviews and More from Wild Die. Facebook fans 512. Twitter followers 6,568. About Blog The RPG ART OF Jez Gordon. Find posts and updates on RPG. About Blog Hi I'm S. P. I have been running roleplaying games since 1998, and playing since a little after that. In 2011, I decided to start writing about the hobby. Find posts and updates on Roleplaying. Indiana, USA About Blog Join lifelong gamers James, Kurt, Lacey and guests around the table as they geek out about tabletop RPGs, gaming and gamer culture. Facebook fans n/a. Twitter followers 1,291. Ottawa, Canada About Blog Hi I'm John M. Kahane. I was Born in England, I ama a translator, freelance editor and writer, amateur palaeontologist, avid book reader, roleplaying gamer, and music fan. I post and updates about RPGs. Campinas, Brazil About Blog Hi I'm Ubiratan Pires Alberton. Octopus Carnival is my English-language RPG blog. Most of its content is GURPS-related, and usually deals with adapting something or other to GURPS. Find posts and updates on RPGs. Braxia About Blog I'm Guy Sclanders and this channel is about sharing Tips and How To's on being a Great Game Master and crafting worlds for your players. This is an entertainment channel on Youtube where our Geeky Guys and Girls play Roleplaying Games. Facebook fans 2,420. Twitter followers 4,067. About Blog Annual RPG Speedrun Charity Marathon, plus other great online RPG speedrun community events. Facebook fans n/a. Twitter followers 6,568. About Blog Game Master Kurt Wiegel reviews and educates viewers on role playing games. Portugal About Blog I'm an avid gamer, particularly fond of role-playing games for PC. My channel is all about playing RPGs and sharing the experience with everyone. Northampton, England About Blog The City Life RPG MOD is an Online RPG built on the Armed Assault engine offering an online community for you to enjoy. It's a mod for ArmA3 is an online role playing community. Facebook fans 1,697. Twitter followers 265. UK About Blog Welcome to Autocratik by David F. Chapman. He is a writer, game designer, editor, publisher and all-round control freak. Facebook fans 989. Twitter followers 1,420. Seattle About Blog SuperDerek RPGs is your home for RPG Reviews and playthroughs. Featuring videos from like-minded RPG enthusiasts. We'll help you find your next favorite. Facebook fans 303. Twitter followers 621. About Blog Gaz and Baz have spent decades talking about games. They present the UK's premier RPG podcast. Facebook fans 135. Twitter followers 530. White Plains, NY About Blog I'm VB Wyrde, a Role Playing Game designer, working on the Elthos Game System, which I started in 1978. I posts and update the mysteries and wonders of developing and GMing the Elthos RPG and Mythos Machine. About Blog Dedicated to the RPGs for the classic 16-bit system, the Super Famicom (Super Nintendo in the US). The purpose of this blog is to record my playthrough of all the Super Famicom RPGs that were not released in English, in chronological order. Germany About Blog die heart is the wonder of role-playing games. Find reviews, solo rpgs, old-school & narrative games. Facebook fans n/a. Twitter followers 1,113. UK About Blog UK Role Players is an online resource dedicated to role players in England, Northern Ireland, Scotland, and Wales. Members write articles, monthly columns by published (and unpublished) writers, an indepth listing of clubs and shops across the UK, details on upcoming conventions, member submitted downloads, industry news and releases, reviews, a friendly and active forum, and much more. Facebook fans 1,129. Twitter followers 1,097. Lexington, KY About Blog Role Play Craft is written by an Amateur role playing blogger, focusing on creating story content and mechanics for role playing games. This blog is dedicated to Role Playing Games -specifically the side of them in which you create things of your own. House rules, home brewed character options, settings, adventures, campaign ideas, you name it and I will probably have touched on it at some point. Facebook fans n/a. Twitter followers 2,007. About Blog The Dungeon Dozen is a blog to focus laser-like on providing flavor-rich yet detail-free idea stimulation for fantasy RPGs in the form of random tables for the underused 12-sided die. Boston, MA About Blog Hi I'm Tracy Hurley and I am a gamer. I posts about role-playing games (especially Dungeons & Dragons) and sometimes me. This blog documents my exploration of the deep, deep hole that is known as tabletop gaming. Facebook fans n/a. Twitter followers 4,380. About Blog RetroRoleplaying.com started out as a site devoted to out-of-print, unsupported, and/or out-of-style tabletop roleplaying games. You can find posts and updates on roleplaying games. Nottingham, UK About Blog 6d6 creates and publishes tabletop role-playing games (RPGs) for people who like fast, light games which promote role-playing and creativity. It is fast, flexible and fun tabletop roleplaying games. Find news on 6d6's range of role playing games, adventure, PDFs, setting and supplements. Facebook fans 456. Twitter followers 1,292. About Blog Roleplaying with GURPS can be simple and straightforward. Whether you are new to GURPS, new to roleplaying in general, or an experienced GURPS player just looking for ways to streamline your games, this blog is for you. Find posts and updates on GURPS and RPGs. Shah Alam, Selangor About Blog Role Over Play Dead is a blog about how we roleplay, from the first spark that creates an interesting character to the last desperate moments when heroes go down. Here, we'll discuss how we can make roleplaying more accessible, more interesting and more fun. We also cover RPG news, reviews and reports. Facebook fans 294. Twitter followers 140. Australia About Blog The Immersion RPG System is brought to you by Immersion Studios, a game and publishing company that aims to give you the ultimate role playing game experience. You can buy all things Infected Zombie RPG. Facebook fans 502. Twitter followers 617. About Blog Justin is a 20-year veteran of the videogame industry, and I've been playing table-top RPGs even longer. During my time in the games industry, I worked as a designer, producer, and creative director on a number of titles, including Shadowrun, KKND, Le Mans 24 Hours, Heroes of the Pacific, Heroes Over Europe, and Damage Inc. Pacific Squadron WWII. Find posts and updates on RPG. Facebook fans 1,253. Twitter followers n/a. About Blog The RPG Brewery is a place to sit down, have a beer and talk about gaming. It will be focused on tabletop roleplaying games, but can offer a variety of different topics. Facebook fans 184. Twitter followers 297. About Blog We are Storybrewers. We lovingly brew roleplaying games eagerly waiting to come to life at your table. Find out more about our newest tabletop rpgs. We also have free games and supplements for download. Facebook fans 821. Twitter followers 1,069. Pennsylvania, USA About Blog Fluent RPGs is a RPG-focused gaming channel. Facebook fans n/a. Twitter followers 653. About Blog LotFP is the brutal and wondrous Weird Fantasy tabletop role-playing game born out of love for underground heavy metal, horror literature and film, and in fact all things strange and macabre. RPG releases and general commentary about traditional gaming in general. Facebook fans 2,798. Twitter followers 2,021. Los Angeles About Blog Tony Foster is on a mission to play through all console RPGs. Find posts and updates on RPGs. Philippines About Blog Nosfecatu Publishing is a small 3rd party publisher of supplementary materials for the 4th Edition of the Dungeons and Dragons (tm) game. A blog on Philippine fantasy and myth in roleplaying games. About Blog This blog is about the journey of the family with gaming, seeing the journey through the eyes of my 17 year old twins. The blog is also about our relation as a gaming family. The epic twins and myself will also be reviewing games, RPGs, board games etc. About Blog rpgSPOTLIGHT is dedicated to celebrating tabletop roleplaying games. We post about news, awesome articles from around the RPG blogosphere (old and new), crowdfunding for RPGs, and a once-per-week post about something that we just really dig. About Blog I mostly centered around playing RPGs. I general posts RPG history and news. I'm going to continue doing RPG reviews broken up into: new products & old products. DeKalb, IL About Blog Role-Playing Game articles from Matt Stark. About Blog Find posts and updates on RPG for RPG Enthusiasts. About Blog Fireinthedust Productions presents a collection of adventures by fine Game Masters in a number of RPG rules sets, alongside articles about our various settings as well as advice on running your own games. Here you can find a grand collection of RPG adventures, exciting worlds, and epic tales of heroes of steel and spell. 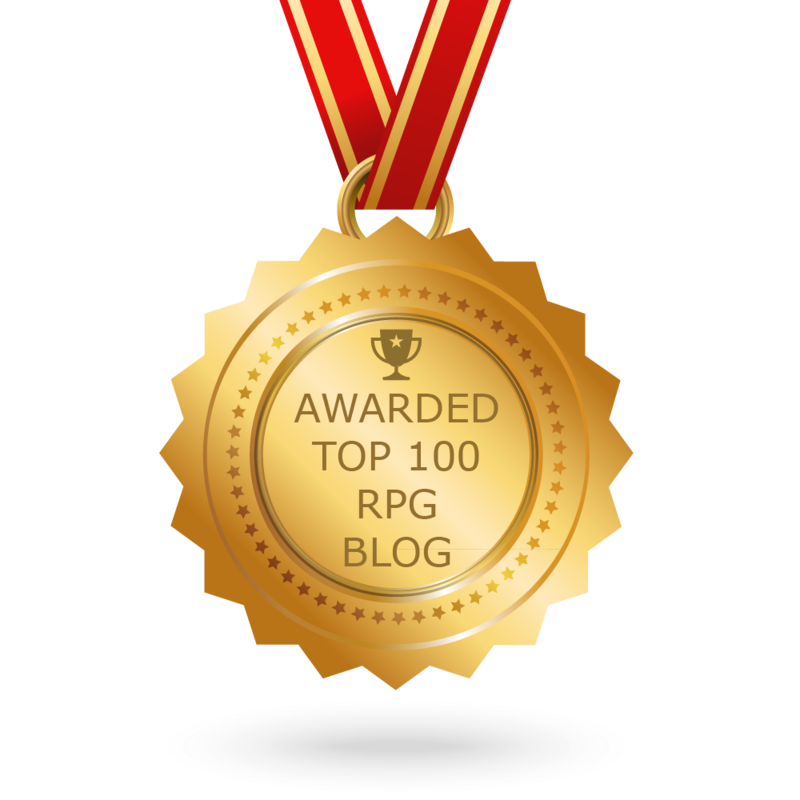 CONGRATULATIONS to every blogger that has made this Top RPG Blogs list! This is the most comprehensive list of best RPG blogs on the internet and I’m honoured to have you as part of this! I personally give you a high-five and want to thank you for your contribution to this world.